Seagate Builds Supply Chain Driven by Customer Demand - E2open | Demand. Supply. Delivered. Highly competitive technology markets are characterized by faster, more powerful and less expensive products that are quickly replaced with next-generation models. 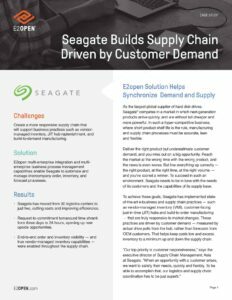 To produce the right products in the right volumes at the right time based on customer demand, Seagate required a more responsive supply chain. With E2open, Seagate enabled full order and inventory visibility, giving suppliers timely insight into actual customer demand while cutting costs and opening up new opportunities.